My favorite way to vacation is by renting a house vs. staying in a hotel. We've done that for a lot of our travels over the past few years, renting places in D.C., Arizona, and Charleston, to name a few, and now that we have Brecken, renting a house is absolutely the better option. We like being able to put Brecken in a separate room and not worrying about disturbing her if we stay up later. We also like more SPACE because goodness knows between all the stuff babies need and my terrible propensity to overpack. Most of all, we like having amenities like a washer and dryer and a kitchen! Much as I love exploring new restaurants on vacation, it's nice to be able to prepare some meals or stay in for easy breakfasts or lunches. On our most recent trip to Orlando for my cousin's wedding, my entire family rented a beautiful house with laundry facilities, bedrooms for all (no easy feat now that there are 8 of us plus 2 babies! ), and a POOL. It also had a kitchen that we took advantage of, but on our last evening there we were tired from rocking the dance floor at the wedding and splashing around with the babies in the pool, and we opted to order in pizza. I've heard of Mellow Mushroom, but this was my first introduction to the pizza chain and we were impressed by the inventive topping combinations and the right balance of toppings to crust / sauce / cheese (in my book more toppings is always better!). Of the three we tried, the Magical Mystery Tour was my favorite. The best part of that pizza was the heat from the jalapenos and I knew the next pizza I made at home would include the spicy pepper! My version is slightly different, I swapped havarti for the feta and mozzarella, simply because that was what I had on hand (although my sister and I decided this was even better than the original!) and completely forgot about the spinach (I'll add next time! ), but even without the green veggie I'm willing to bet my version was decidedly healthier and undoubtedly tastier! 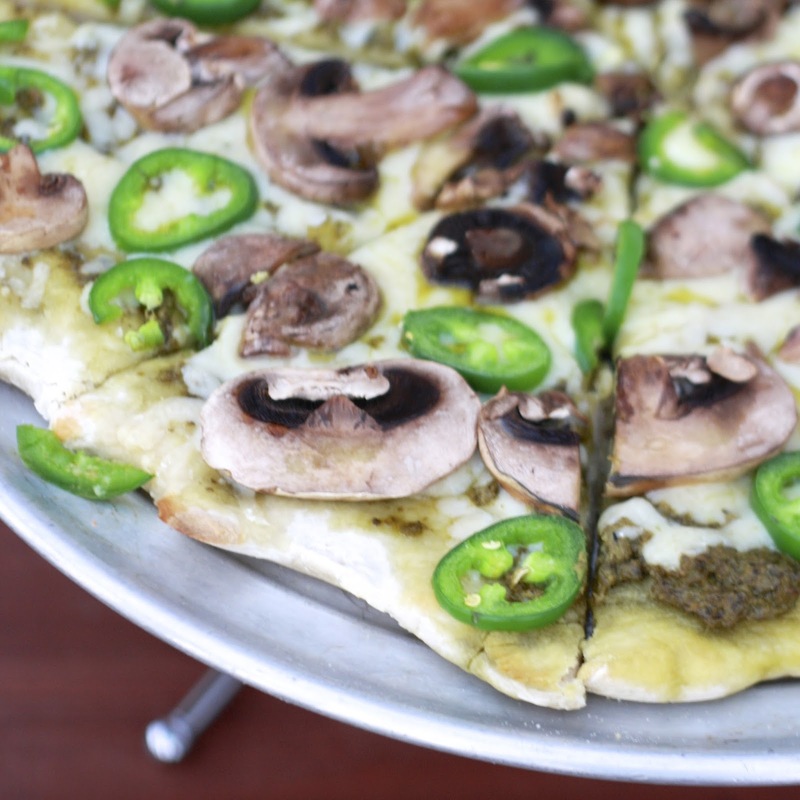 This homemade pizza is about as easy as it gets, if you buy premade pesto and use presliced mushrooms, making it perfect for a weeknight dinner. And you can't beat eating pizza in the middle of the week that tastes like vacation! 1. Preheat oven to 500F. Stretch pizza crust to fit parchment lined baking sheet or pizza pan. Bake crust for 15-20 minutes or until bottom begins to brown. 2. 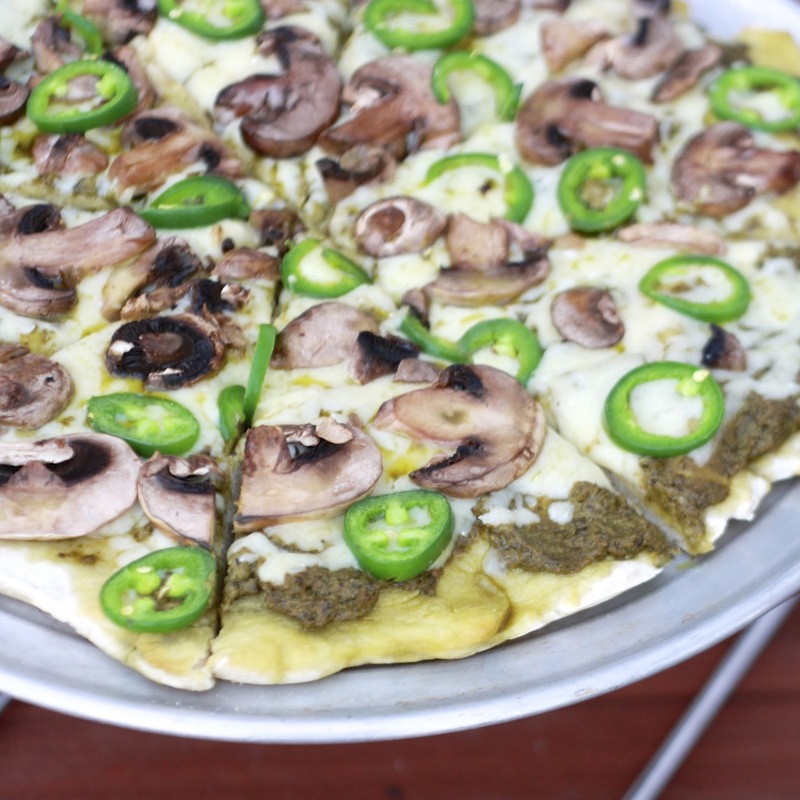 Spread pesto over pre-cooked crust. 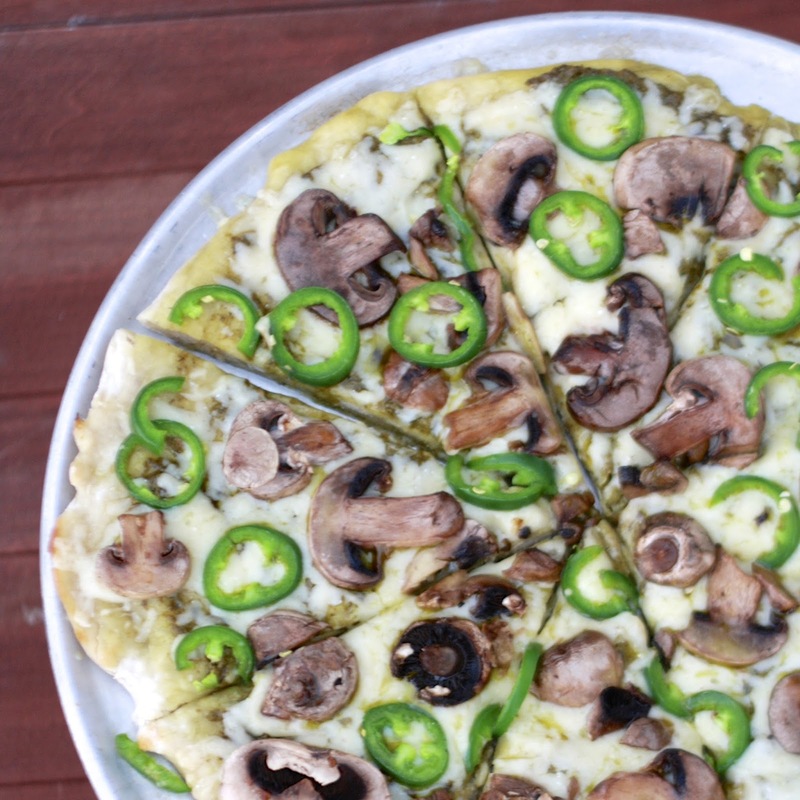 Top with cheese, followed by mushrooms and jalapeno. Return to oven and bake for 10-15 minutes until crust is desired texture and cheese is melted. 3. Cut into slices and serve.